Notes is a web application for storing your encrypted notes in the cloud. It takes a different approach from Laverna which stores your notes locally without encryption. Notes, however, works like Evernote on principle. Password never sent to the cloud. If you forget it, your notebook is also gone. GitHub Gist is a place to store all your code snippets and notes for easy showcasing or sharing. The service has many official and unofficial clients to post of fetch text. We found a new shell script based client that allows sending text right from the terminal. The gist script (gist.sh) allows you to post test as a registered user or anonymously. You can send text files or text. When you run the command it returns you the URL of the new gist created. -f Specify a filename of an existing file to send as a gist. $ gist.sh -n test -c "This is a test\nPlease ignore"
//Note that newlines need the \n character. To get the utility, download the repository. Extract and use the gist.sh script. It uses curl to send your text to the Gist service. We wrote about Nitro and Springseed earlier. 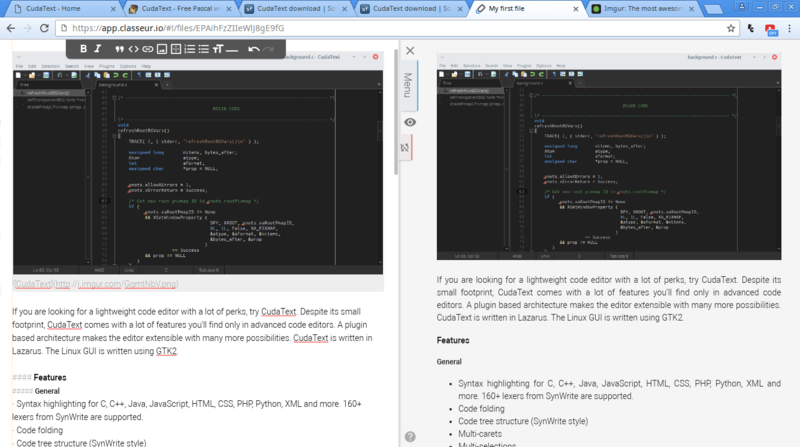 Both of these native apps are good alternatives to Evernote on Linux as they can integrate with Dropbox. And then we have Nevernote (aka NixNote) – the multiplatform (JAVA based) open source client designed to work with Evernote. Recently we came across another open source project which is a very capable alternative to Evernote. Laverna is written in Javscript and can run online in your browser or can be installed locally. Use markdown text to create beautiful notes with Laverna. I drafted this article in Laverna. Laverna has native desktop clients too. No registration needed for the online app. Laverna uses IndexedDB and localStorage. All the information will be stored only on client-side. Can encrypt the client-side notes with SJCL library. Optional synchronization with cloud storage. Markdown text. Laverna web app uses pagedown and ACE editor. Clean interface. Several editing modes: distraction-free mode, preview mode and normal. Useful editor tools: blockquote, sample code, image insertion, tags. Works as a task manager too. Check the sample note. Runs as a web service, so platform independent. Native client for Linux, Windows, Mac. 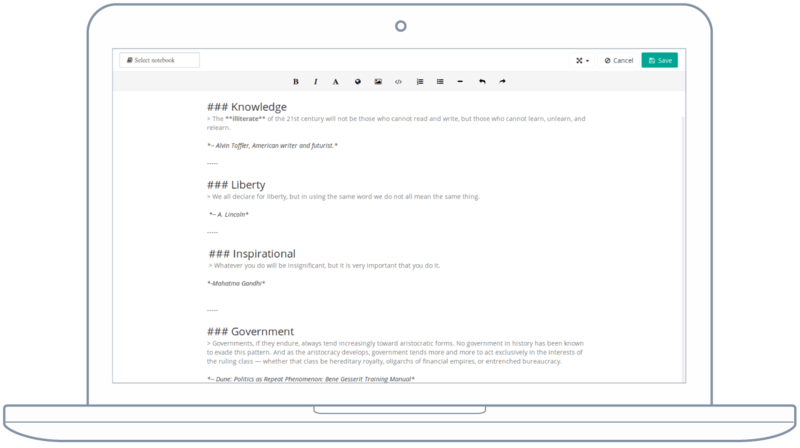 Dillinger is another excellent cloud based markdown editor that stores the notes locally and optionally in Dropbox, GitHub, Google Drive and OneDrive. It also supports many themes and export options. Remarkable is a fully local application but I wouldn’t mind it because of tons of dependencies. Paperwork is a open source note-taking & archiving alternative to Evernote, Microsoft OneNote & Google Keep. Everpad is an unofficial Linux Evernote client. Import documents from or export to different formats like HTML, PDF etc. In case the interface is showing in French for you, change it from the Setings button. The last entry is the Language. I couldn’t find any way to password protect a document and the software silently takes auto-backups. So be careful about entering sensitive data.